Q. What does Gordon himself think of this concept, flushing his Gold Glove and taking up a weird position? You come to SSI in part for the translations. The above is a very nice way to say, "I did not think it possible for a real General Manager to be as stupid as this." Not trying to make a quip. That is what the above quote says and that is what Gordon means. Q. Does it MATTER what Gordon thinks of the 2B-CF move. A. Not at all. Delightfully, here you find a rare situation in which a pro athlete's boss can smile tightly and tell him how it's going to be. And Dr. D is blinkin' likin' it. "Get out there in front of the fence, Dee," sez the boss. "You're going to be fine." He's right; Gordon will be fine. That's not to say Gordon will look as slick, that he'll feel like a rock star every night. He won't; he'll feel awkward and he'll foul up, at which time his manager will tell him "that's no problem, Dee. Keep at it." 40 games in, at which time Gordon is an average-solid CF, we'll all have forgotten the move ever occurred. So Gordon moves from bling and stylin' at 2B in front of packed stadiums, to, grinding what is necessary to helping a ballclub win games. 's OK by me. Gordon's life will retain its share of fun, rewards and happiness. Q. What's the sabe on Gordon's transition. A. Jeff Zimmerman has a "study" demonstrating that middle infielders lose MAYBE a little going to center field. Think about all of the PART time players who do this; nobody ever thinks twice. If the Mariners had a 60-SB Willie Bloomquist playing SS and they needed him in CF, they'd just use him there and we wouldn't talk about it for two paragraphs. Dipoto points out that Gordon is not only blazing fast, but also explosive in his acceleration. The man is SUDDEN in his first step and, supposing he doesn't read the ball great, that makes him average out there. Like we sez, he'll be fine. The upside is that he'll be excellent. Q. What does the Mainframe think of Gordon as a hitter? I mean, in 2015 the man batted .333 and stole 58 bases. Last year, he scored 114 runs; let me read that phrase again. He rakes MVP votes. He's got a bread-and-butter game to him, a baseline turnaround good for 20.0 points per game. 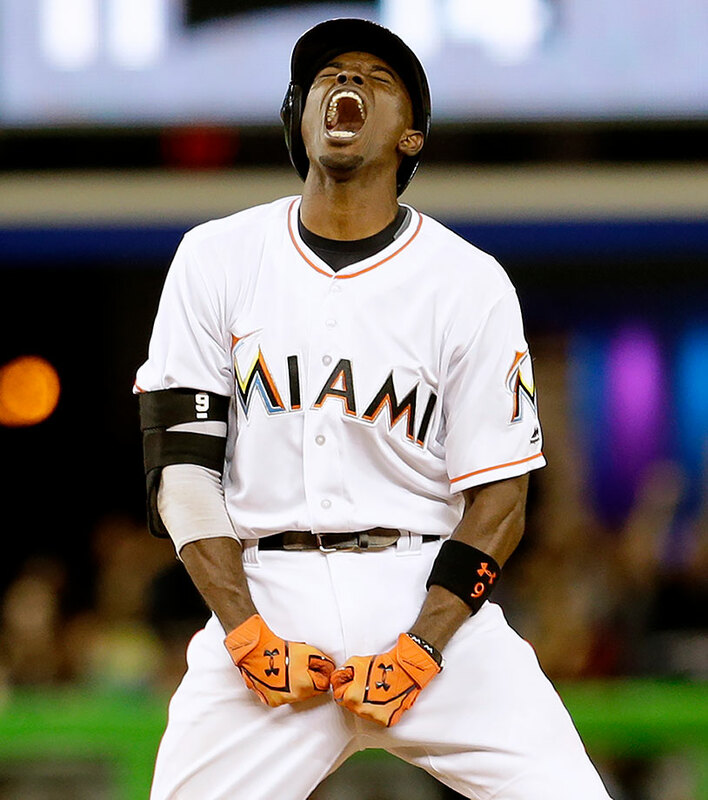 It's not a guess-and-hope dealio here; Dee Gordon can play major league baseball. His last three non-injured seasons he produced 3.3, 4.8, and 3.3 WAR and you can bank the same for 2018-20. M's fans aren't happy enough about this move. Doing drills, shagging, running to the wall at the gap. Already looks like he should be there from what I've seen. Not to say he has it down but he's working and doesn't look nearly as raw as expected. He can run to a spot as fast as anyone. Question: will it be the right spot? Welcome home, Doc. Good to see you ambulatin'. Breathing is good, too. Haven't we had this conversation about great athletes moving to center before? Robin Yount from all-star SS (and Mickey Mantle before him),Dale Murphy and Craig Biggio from catcher. Tons of others. I'm not worried. It's basically a swap of Dyson's plus defense for Gordon's plus bat. And younger, too. I can't imagine that Gordon isn't a passable CF'er. Odds are that he's better than that. Worst case is that he's pretty good in LF, and we move Haniger/Gamel accordingly. He will be fine, probably well before 60 games have come and gone. You can bet that he finds a college team to workout with come January, then he will show up early ini Arizona and he will get 20 games in CF there. He's been a + defender at SS and 2B, plus he can run. Give him a few reps and he will figure out jumps and routes, etc. Not an issue with me. ...Dee Gordon is the fourth weakest hitter in the game, as measured by hard-hit percentage. Softly-hit grounders, good wheels, and good strikezone coverage...that can work. Luis Castillo is the example. Thing is...those guys tend to immediately go from good to waiver wire fodder the instant they lose even one step. Which tends to happen around age 32. Look at his b-ref comps list. It's not a perfect tool, but it gives you an idea. for example, has about 25% more hard hit (4% added to Dee's 16% =20%). Or 4% more if you're trying to minimize the difference...Not seriously trying to say they're much the same, strike zone/ grounder/ wheels reminded me a bit though. ...Ichiro lasted a long time because his speed lasted a long time...he's the exception, rather than the rule. It's POSSIBLE that Gordon will stay fast, but the statistical odds of this are not great. Would it get our best players on the field to have him play second and shift Cano to first now rather than later? Could be the only reason it doesn't, now, is Robby's pride and political clout. A lot of times in the NBA and MLB it's what the $20M player wants, not what is best for the team. At 1B, Robby could probably give plus D and relax into a .500 SLG season. And then you'd have the ASG Gordon. But next season, even if Healy works out nicely, you could package him with some fodder (in Dipoto's world, if you're not central to his plan, you're just fodder... :) ) for a nice club-controlled arm and make that switch. ....that we can dump Gordon for $1M after his age 32 season. But I know what you mean, Matt. I prefer homeruns. But if Gordon can be a .300-.333 guy for two seasons.....with his SB's, then the 3rd season can go ahead and be rotten. Our infield plays slow. To hit .300 here, Gordon will need to bunt more, IMHO. His career bunting average is .454 though...so he's a good bunter. in CF, but he's a lot closer than anyone we've had since we had him pumping out ~5 WAR from the position. I *love* Gordon's game. Absolutely love it. He's Juan Pierre out there, with better defense (as a 2B, at least), and I always drooled over the idea of Pierre playing alongside Ichiro back in their primes. Gordon's going to be as good of a leadoff hitter as this team has had outside of Ichiro. I love his addition to the team. Not to be too pessimistic, if Dee Gordon (moving to a new position, no less) is your A-1 add of the offseason, you ain't gonna do much catchin' up to the Big Dawgs without a hefty dose of 'luck.' I'm good with squinting to find that luck, but it's an uphill climb. It's like we needed a rocket launcher and added a rapier. As much as it's good, I have no clue if it'll be effective. A part of me is not convinced. Chone Figgins has cast a long shadow for forced position changes. The general Figgins similarities. Been calling it the reverse Ackley instead. Sounds more positive. Gordon doesn't produce GOBS of value with his glove, even though he's elite at 2B. He produces it with his legs (which *generally* age gracefully; the comps I randomly picked out for a previous post only featured *1* player whose speed was elite at 29, and whose speed was no longer elite at 32) and with his slashing, reverse-TTO approach. When you're banging the ball on the ground, you DO need your speed in order to get enough hits to be a plus offensively. But his game is so stupid-simple (slash the ball on the ground and burn to 1B so you can steal on the next pitch) that the *only* way he doesn't produce very, very well for the next few years is if his elite speed pumpkins on him soon. Guys with borderline great speed *do* have their speed vanish overnight. But guys with legit, all-world speed (and 'jump') don't have that happen. Heck, NFL WR's that have burner legs undergo knee surgeries and STILL have plus speed for a few years afterward. It's those tweeners (like Figgins?) whose 'base-running' is more based on SKILL (getting good reads, jumps, etc..) that have their legs go in the blink of an eye (seems to me, anyway). Also, Figgins INEXPLICABLY drew 60+ walks per season. with a career-high of 101 in 2009, his last season with the Angels. You generally don't draw that many walks without a little bit of power to keep pitchers honest, so he was something of an enigma to begin with, with the ultimate set of 'soft skills' that you could dream up. Gordon's got none of that. He's a mini-Ichiro out there (minus the pop and some patience), which is good and bad. It's good because he EARNS every base hit, just like Edgar EARNED every single double in his storied career. It's bad because, as everyone astutely observes, as soon as his speed becomes less-than-elite, he's probably done as an ML-average hitter, let alone an impact player. Chone Figgins, he is not. But it takes a heck of a manager to get a player to believe in themselves when they go through a change. Mark McLemore was angry when the M's signed Boone, but Lou was able to push the right buttons. Chone Figgins was not happy to move to 2B for Jose Lopez, and Wakamatsu had no clue how to fix that. Career over. Reading through the lines Dee is NOT happy. Because of that I'm more down than up. MLB players are particularly horrible at adjusting on the fly and/or playing unhappy. Except for the initial response by his agents which also claimed he hadn't heard of a potential position switch until after the trade. Since that was later debunked (Ms talked to him about moving to CF before the deal went down) and he has only shown positivity and determination in the move in the interviews I've heard and seen since then, I have read it that he's happy to be here. He knows Cano and said "If there's anyone in the game I'd move for, it's Robbie." His initial response was more mixed. Since then he's diligently started learning CF, talking to people about how to go about it and practicing drills to get it down. At least he's not on Miami's squad, there's a chance he'll be playing for something. I don't read unhappiness anywhere, at any point directly from him. Only his (since proven to mislead) agents initial response read that way for me. Even if his initial response was negative he's done nothing since then to make me think he's brooding and festering. When Hatteberg was approached by Beane about playing first base after a long career as a catcher, his response was, reportedly, "You frickin' crazy??" He almost didn't sign but knew Beane was right about his arm being gone and him needing to learn something new to stay in the game. So he agreed to give it a try. Then he spent all of spring training afraid of the ball (he said as much many times - "What's you're biggest fear when you're out there at first?" (his reply) "that someone will the ball to me." Yet, he actually turned into a passable defensive first baseman and grew very happy in the role. Most players balk at first when you tell them they have to learn a whole new position. It's the next reaction that matters most. Figgins' next reaction was "c'mon, man...he can play either position, too...why can't he just play second!?" I don't think Gordon's attitude will be a problem. I just think players who barely tap the ball don't last very long. It's the cross-section that has me discouraged. I agree with the erodable skillset angle to an extent (I don't think it'll be Figginsian, but...), yet I'm also not a fan of pulling MLB veterans out of their comfort zone without a good internal reason. Honestly, Cano's probably the best reason to move, but at the same time, it's not the same as dealing with an injury like Hatteberg. We always like to talk about how you can't predict up or down years, but I put the thumb on down years when things like "play somewhere new, because" is part of the equation. Players like Hatteberg and Biggio (who moved to center in his age 36 season!) are rare, so we remember them more. Figgins got paid for two unsustainable figures: His .391 BABIP in ‘07 and his 101 BB’s in ‘09. Together, those made him look like much more of an offensive player than he really was. But both were so far above anything he had done before that they could not be sustained. The .391 was 10% better than his next two best seasons and his 13.7% BB rate in ‘09 was a 43% increase over his next best season. He had two anomaly seasons and we paid him handsomly and stupidly for them. As well, Figgins was never an elite base stealer, he was a volume basestealer. In his 3 prime years of ‘07-‘09 (immediately before we signed him), he stole 117 bases, but only at a 73% clip. He may have made pitchers uncomfortable, but he wasn’t great at swiping bags. Decades ago, Bill James calculated that it took a 75% rate for base stealing to pay off. Below that, the extra outs more than cancelled out the extra base. When Ichiro, for example, was at the equivalent career stage (4 full MLB season behind him) as Figgins was in ‘07, he stole 115 bases in the next three seasons (very similar to Figgins’ 117), but he did so at an 87% clip. He was an elite base stealer. Gordon is a volume stealer, like Figgns, but with a better rate. Over the past 3 seasons, with 4 MLB seasons behind him, Gordon has been successful 77% of the time. He isn’t Ichiro in that department. But he’s better than Figgins. All good points in re: Figgins vs. Gordon.